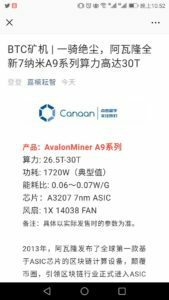 Canaan announces Avalonminer A9 – The most efficient 7nm Bitcoin miner in 2018 ! 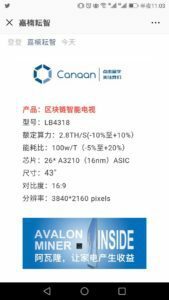 We are happy to announce that Canaan Creative has finally disclosed information about their new 7nm bitcoin miner. Today, we are going to see the ASIC technology future, the new 7nm chips that will probably change the mining world by reducing power consumption and making it more decentralized. 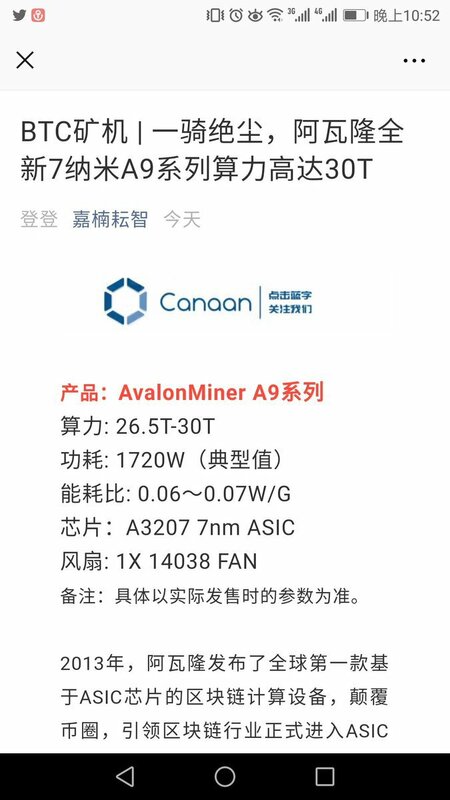 Canaan announced this 7nm miner before bitmain has announced their new generation and we are glad that canaan is finally one step ahead of the competition. 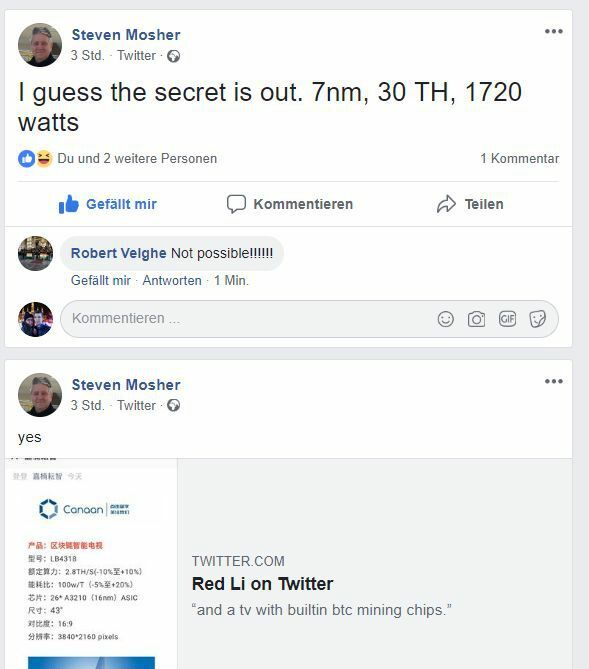 Red Li (@redtheminer) has leaked the specifications on twitter and they have been confirmed by steven mosher aswell. 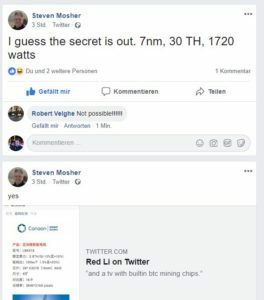 Red Li has postet a screenshot which unveils the specifications of the new miner. It will run with up to 30TH/s with around 1720W at the wall. Making it the most efficient bitcoin miner in 2018 with a mindblowing 0,06 to 0,07 W/GH. The new mining chips are called A3207 and are based on 7nm technology. It will still be cooled by a single fan and use similar cooling technology like the previous models. This is way better than any other miner right now on the market, but still, we don’t know the exact availibility yet, but believe that they will come at the end of this year. Companies like Samsung, Intel, TSMC and Globalfoundries are all trying to create 7nm chips in mass production. In the bitcoin mining world, especially in the application-specific integrated circuit (ASIC) field, the current semiconductor chips used at this time are between 16–14 nm. So this is a big step into the future of more efficient cryptocurrency mining. Will the Avalon A9 be reliable ? Canaan Creative is one of the leading companies in the mining field. Even though bitmain is bigger in sales, Canaan has always had the better and more reliable product. Unfortunately the extra quality had it’s price, but now with the new 7nm miner, this could be a huge gamechanger. From our experience we can say that avalonminers are very high quality and the in field falure rate is less than 1%. So we expect that also the Avalon A9 will live up to Canaan’s high standards. When can you order the new 7nm bitcoin ASIC ? We don’t have any final dates yet, but as soon as it will be available, you will find it in our shop. If you are interested in being among the first to know more about the new miner, make sure to join our newsletter. If you are interested into pre-ordering, make sure to contact us and we will put you on the list ! Canaan releases even more products! A Bitcoin mining Television. Yes you heard right! 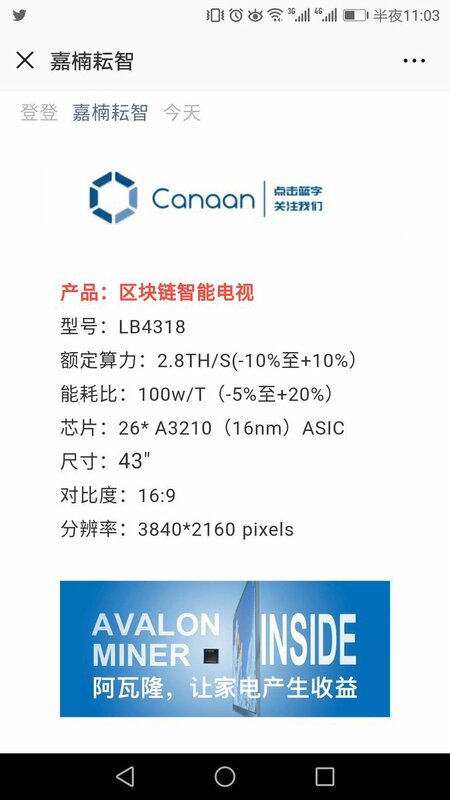 Canaan Creative also announced some lifestyle products like a TV with 16nm mining chips inside. The TV features a 43″ 4K panel (We don’t know if LCD or OLED yet) and includes 26 A3210 16nm mining chips which can put out a hashrate of 2,8TH/s. Now for sure this is not a competitive industrial product, but a nice lifestyle product that can do the trick for marketing purposes. We are very excited about it aswell and will post news about it as soon as possible. In may, the Hangzhou-based chip maker Canaan has raised RMB300 million (US$43 million) in a series A round from a number of investors including Chinese hotel operator Jin Jiang International Group Co., Ltd, Chinese investment firms Baopu Asset Management Co. Ltd. and Tunlan Investment. The round values Cannan at RMB3.3 billion (US$480 million) post-money, according to Chinese media reports. Canaan develops application-specific integrated circuit (ASIC) chips, combining artificial neural networks with processors. The product can be applied in the artificial intelligence fields including smart home appliance, autonomous driving, voice interaction and image recognition. So we will see some more lifestyle and home appliance products by canaan soon. By the time this is actually released, Bitmain will have probably released and put on sale their next-generation miner. Doesn’t seem all that efficient for such a big jump in tech – but given both of the announced “7nm” process are in actual specs barely smaller than Intel and Samsung’s 10nm EXISTING process, it’s not actually all that big a shock.